Miniature FAIRY GARDEN Shale Fountain NEW | Fountain City Art Ctr. Miniature FAIRY GARDEN Shale Fountain NEWItem Well Miniature FAIRY GARDEN Shale Fountain NEWA working two-tiered shale rock fountain with pump.Note: This fountain plugs into a standard electrical outlet.The size of this Fairy Garden item in inches is 4.5" High and it is made of Resin. 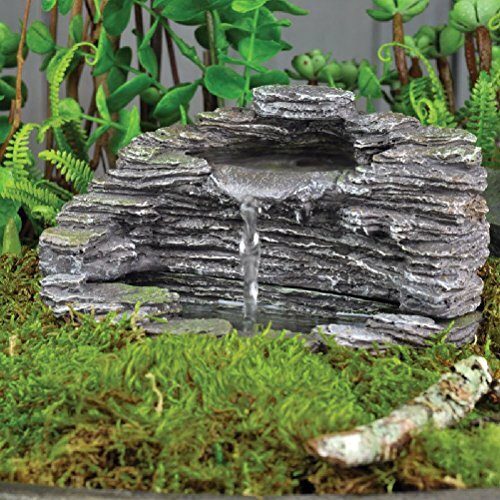 Shale Fountain ~ NEWItem Well Miniature FAIRY GARDEN ~ Shale Fountain ~ NEWA working two-tiered shale rock fountain with pump.Note: This fountain plugs into a standard electrical outlet.The size of this Fairy Garden item in inches is 4.5" High and it is made of Resin. please note that we accept 14 days returns , and customer need to response return shipping fee and 15% restore fee as non the product problem.